Home Jewish World United States Despite Women’s March controversy, key teacher’s union boss and supporter remains steadfast. In an ironic twist American Federation of Teachers President Randi Weingarten appears to have embraced known anti-Jewish activists while in the midst of responding to an alleged anti-Jewish attack against the AFT. On December 12, 2018 the American Federation of Teachers’ headquarters in Washington, DC was allegedly subject to a vandalism attack in which spaces in and around the facility were spray painted with the words “I want Jexit”. On searching for #Jexit on Twitter, it becomes apparent that the hashtag appears to refer less to Jews than to either the desired firing of Manchester United manager Jose Mourinho which happened to have occurred only six days later, or to past attempts to topple UK Labour Party leader Jeremy Corbyn. One other interpretation is that #Jexit refers to a possible exit of Jamaica from the Caribbean Community (CARICOM) in imitation of the UK’s Brexit from the European Union. There is no other known context to the term that is connected to Jews or Judaism. Weingarten has led the nation’s second largest teacher’s union since 2008, and prior to that was president of its largest branch the United Federation of Teachers in New York City from 1998-2008. She is also Jewish, openly gay, and married to Rabbi Sharon Kleinbaum as of May. Kleinbaum’s synagogue, the Congregation Beit Simchat Torah, bills itself as the world’s largest LGBT synagogue with 1100 members. In light of the above background it seems very ironic that Weingarten and Kleinbaum posed for a photo with Women’s March co-chairs Tamika Mallory and Linda Sarsour on December 10, as shown in a tweet from Weingarten’s account. The Women’s March as a whole and both Mallory and Sarsour in particular, have been rocked over the past year with allegations of being connected to hard-line anti-Jewish Nation of Islam leader Minister Louis Farrakhan of Chicago as well as propagating their own similar beliefs. The same day as Weingarten’s tweet with the two co-chairs, a special report was released by The Tablet Magazine that included accounts by the movement’s original founders of racist and anti-Jewish statements that were made by Mallory and another co-chair Carmen Perez during the initial planning meetings for the group in late 2016. By December 22 Mallory had poured even more gasoline on the fire by stating in an interview with the New York Times that “since that conversation, we’ve all learned a lot about how while white Jews, as white people, uphold white supremacy, ALL Jews are targeted by it”. What is often ignored is that Mallory, who is the main conduit of the Women’s March to Farrakhan’s movement, was also an adviser to Vice President Joseph Biden in 2013 concerning issues of gun violence and served on New York Mayor William de Blasio’s transition committee. This is a moment of moral clarity. You either stand against racism and anti-semitism and bigotry or you don’t. In December 2016 she also tweeted the following in response to allegations against Rep. Keith Ellison (D-MN) who was at the time running for DNC chair. Rep. Ellison has had a long documented history of activity within Farrakhan’s movement that he has denied, a controversy that led to a blow-up interview with Jake Tapper in June 2016. Farrakhan also alleged that Ellison had met him privately in a Washington, DC hotel suite in 2015, a meeting that Democratic Rep. Andre Carson confirmed having attended in 2018. 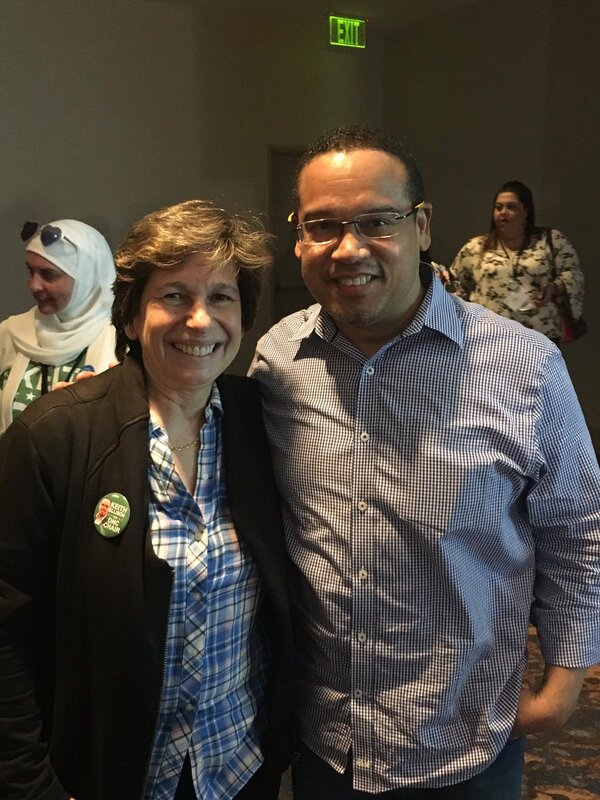 Yet Weingarten went so far as to write an op-ed claiming that she was “organizing and mobilizing” on behalf of Rep. Ellison during his chairmanship bid and posing with him as shown below. It should be noted that beyond Farrakhan’s well-known statements regarding Jews dating back to the 1980s, he has also spoken out for decades regarding the sinfulness of homosexuality, views that if uttered by a Protestant minister or Jewish rabbi would have been roundly castigated by Weingarten and Kleinbaum. And in 2014, long before the Trump Administration controversies over Russian hacking in the 2016 election, Weingarten rejected a progressive follower’s objection to the AFT’s support for the Kiev government over Ukrainian anti-Semitism during the Crimea crisis by claiming that he was “supporting the Russians”. So it would seem that for Weingarten, as a union boss, lesbian, and wife of a progressive rabbi, the imperative of standing against anti-Jewish expressions is wholly contingent on the interests involved, not on any specific moral conviction. Left-wing Jewish columnist and anti-war activist Nat Hentoff in 1985 penned an article called “Strategic Silences on Farrakhan” objecting to the refusal of of local New York politicians like Charles Rangel and members of the NAACP to condemn Farrakhan following his statement that to the Jews that “don’t you forget, when it’s God who puts you in the ovens, it’s forever! Today, less than two years after Hentoff’s death it seems that on the left, even on the “Jewish left” represented by Weingarten and Kleinbaum, strategic silence has been replaced by willing collaboration.